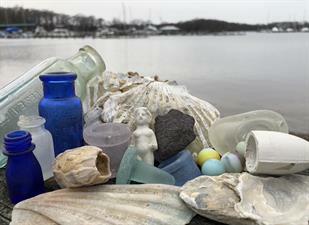 Beach Finds of the Chesapeake is free with festival or general CBMM admission, with the two-day Sea Glass Festival tickets set at $15 for adults; $12 for seniors and retired military; $6 for children 6-17; and $5 for CBMM members, member’s children 6-17; and active military (ID required). Advanced admission tickets can be purchased online at cbmm.org/seaglassfestival. Beginning Saturday, April 6 and continuing through June 29, the Chesapeake Bay Maritime Museum in St. Michaels, Md. will be exhibiting Beach Finds of the Chesapeake. The special exhibition kicks off the April 6 & 7 Eastern Shore Sea Glass & Coastal Arts Festival, which has been moved this year from St. Michaels’ Mill district to CBMM’s waterfront campus. The exhibition is organized by the Sea Glass Center, a non-profit organization preserving and presenting the historical, artistic, and cultural significance of sea glass through education. 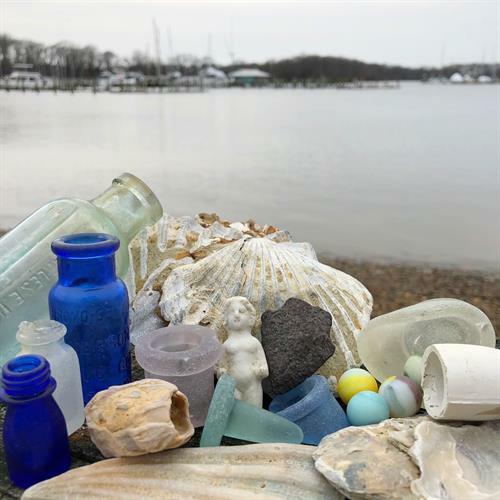 Beach Finds of the Chesapeake explores a sampling of the different types of finds discovered by those who seek to preserve the history of the region by collecting fragments of its past. From shark teeth and other 20-million-year-old Miocene-era fossils, through Victorian doll parts and marbles, to modern plastic toys and marine debris found today, the Chesapeake Bay holds history, treasures and trash alike to be discovered by beachcombers who search its disappearing shorelines. The 8th annual Eastern Shore Sea Glass and Coastal Arts Festival will feature more than 70 artisans—many from the local Delmarva area, and others travelling from as far away as New England—who will exhibit and sell coastal and sea-glass related jewelry, home décor, art, and more. The festival also includes educational lectures about sea glass and its history along the Chesapeake Bay’s shores.